Different U.S. states have different gun laws. That can cause a massive headache and pose potential trouble with the law for gun holders who travel between states. Now a woman is pushing for change in the barriers to guns being carried between states. The firearm that Shaneen Allen was carrying when an officer pulled her over on a New Jersey highway could have sent her to prison for years were it not for a pardon from state governor Chris Christie, reported the Beaumont Enterprise. The mother from Pennsylvania ended up in jail for 48 days. Now she is pushing for a measure that could shakeup handgun laws across the country. Allen was pulled over in 2013 when she was driving on the Atlantic City Expressway and accused of making an unsafe lane change. She told the police officer who pulled her over that she had a firearm and a Pennsylvania-issued concealed carry permit. Allen spent 48 days in jail before being admitted to a pretrial intervention program. She was interviewed by New Jersey Governor Chris Christie in 2015 and eventually pardoned. Christie has also pardoned residents of Florida and North Carolina who faced charges even though they legally possessed firearms in their home states. Allen is supporting a measure that’s controversial on Capitol Hill. 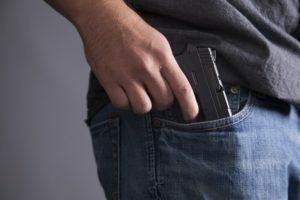 In late 2017, the GOP-led House passed a law to allow gun owners with a state-issued concealed carry permit to carry a handgun in any state that permits concealed weapons. The measure is likely to face greater opposition in the Senate whose members did not vote on it before leaving for the year. The measure pits gun control advocates who claim it overrides the rights of states to impose tougher gun control laws against gun rights activists who say it’s necessary so as gun owners can travel freely without being arrested in states with tighter laws. The measure is a major priority of the National Rifle Association and attorneys general from 23 Republican states who wrote a letter in support of the measure. Texas has liberal gun laws and allows people with a firearms license to openly carry their weapons in most places. Texans who travel to other states must abide by more stringent laws in many other places. It’s easy to fall foul of the law in other states without realizing it. If you are facing gun-related charges in Texas or elsewhere, you should call an experienced Tarrant County attorney.